Recruited to NC State as a three-star tight end at 6-foot-3, 240 pounds, Charlotte, NC native Garrett Bradbury imagined catching touchdown passes in his hometown state for the Wolfpack throughout his collegiate career. Little did he know he’d catch zero passes in his Wolfpack tenure, yet he’d still be rumored as a potential first-round pick in the 2019 NFL Draft. After signing his offer to NC State as part of the team’s 2014 recruiting class, Bradbury packed on the freshman 15 and then some after undergoing shoulder surgery and redshirting his first year on campus. Prior to his first day of fall camp in 2015, NC State coach Dave Doeren told his redshirt freshman tight end to change positions. Doeren moved Bradbury to guard for the next two years, but Bradbury didn’t take on a starting role at guard until his 2016 campaign, where he earned 69.2 overall grade and 75.1 pass-blocking grade across 855 offensive snaps. Bradbury earned a 71.7 overall grade and allowed just 12 total pressures across his 881 career snaps at guard for the Wolfpack. He spoke to the value in his experience at both guard (2015-16) and center (2017-18) and his desire to play wherever a team wants him to play at the next level. The choice should come easy for the NFL team that does take him in the upcoming draft, however. His experience at guard has value, but he was truly at is best with NC State when he was moved to center in the latter years of his collegiate career. Bradbury earned an impressive 85.6 overall grade, 86.3 pass-blocking grade and an 86.8 run-blocking grade across his 1,979 offensive snaps at center across the 2017 and 2018 seasons. His career-high mark in 2018 (84.4) ranked third among the 150 FBS centers with at least 400 offensive snaps on the year. 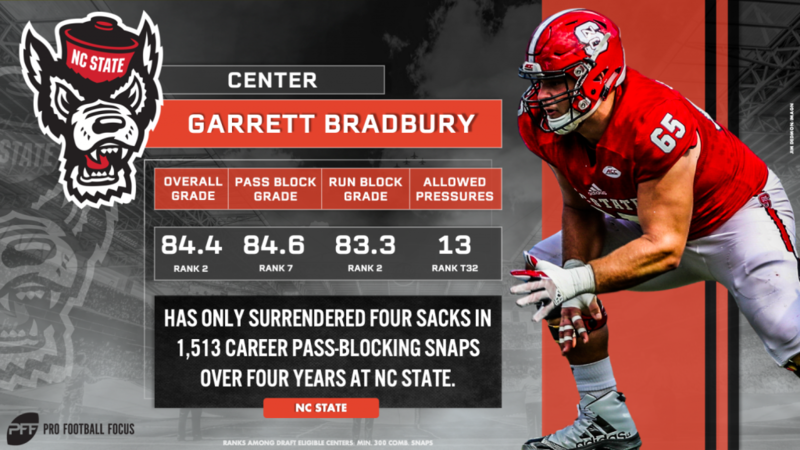 NC State’s heavy usage of outside zone played to Bradbury’s strengths perfectly, as his high-end athleticism was on full display when asked to perform wide reach blocks and get to the second level in a hurry. He ranked third among the aforementioned list of centers in run-blocking grade (83.3) as a result. Bradbury’s athleticism jumps off the tape, and it threw him even further onto the NFL’s radar when he blew the doors off the 2019 NFL Scouting Combine, where he recorded the fastest three-cone time (7.41s) and the third-fastest 40-yard dash (4.92). What isn’t as obvious is Bradbury’s football IQ, his desire to win mentally rather than just physically, and cerebral approach to the center position – all of which stand out as key strengths for the young offensive lineman. “Half of my gameday [at center] is pre-snap,” Bradbury said. “It’s understanding what the defense is doing [and] communicating that to the coaches so we can put ourselves in the best position to win a ball game. In pass protection, it’s sliding the calls, reading the defense where the pressure’s coming from. Bradbury also spoke to the importance of preparation, practice, and repetition. He said coach Dwayne Ledford, NC State’s assistant head coach, always said, ‘gameday is just a reflection of your habits,’ and Bradbury took that to heart this past season. Bradbury has carried over good habits into the offseason, working with EXOS before the Combine to have the showing that he did in Indy. Now he’s working on perfecting his hands, improving his body control at the second level, and he’s preparing himself for the increased speed of the game at the next level – all things he’ll need to learn soon because he’s likely to hear his name called early in the draft and be inserted into a starting role right out of the gate in the NFL.